McGovern Estates is delighted to showcase No. 65 Priory Court. This one bedroom second floor apartment is presented in excellent condition and benefits from a west facing balcony area which enjoys sunshine in the afternoon and evenings. The apartment is situated in the highly sought after location of Eden Gate which is close by to a wonderful array of amenities. Internal viewing is highly recommended. The accommodation extends to approximately 49m2 (527 sq.ft). Built by Cosgraves, who are renowned for their style and quality, No. 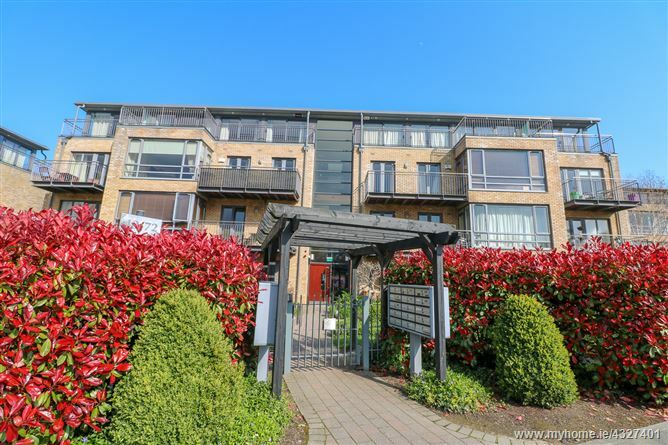 65 is truly the definitive professional home with one double bedrooms, kitchen, living room / dining room, bathroom and a large west facing balcony space. This bright and spacious accommodation delivers all the requirements for modern day living. The internal finishes are truly exceptional with cherry wood internal doors, high quality fitted kitchen and bathrooms and attention to detail, which is evident throughout. Eden Gate is located just off Priory Road in Delgany and enjoys an idyllic setting with a wealth of amenities on its doorstep. from Greystones town and harbour. Here, one can avail of the many amenities in which each location has to offer including a number of award winning restaurants, retail outlets, schools and recreational amenities. A measure of the locations beauty is the endorsement by many renowned golf clubs which are found in plenty supply scattered around the Delgany and Greystones areas. Eden gate is perfect for the commuter and has direct access to the N11/ M50 and is nearby to the various modes of public transport. Laminate wood flooring. Recessed lighting. Security telecom handset. Door to storage cupboard. Alarm panel. Laminate wood flooring. High quality fitted kitchen with range of floor and wall based cupboards, ample counter top space and a range of integrated kitchen appliances.